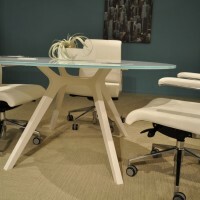 At the 2010 NeoCon show in Chicago, the furniture distributor Jofco introduced the DR Collection of office furniture that Italian designer Claudio Bellini has created for the manufacturer Frezza. 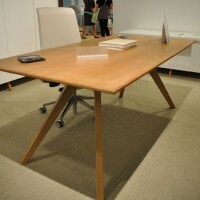 DR, an executive desking series from Frezza SPA of Vidor, Italy is debuting at NeoCon 2010. DR was designed for Frezza by Claudio Bellini. Derived from the concept of a simple, yet beautiful table, Bellini used a combination of clean architectural elements and striking material contrasts to create the distinctive look of DR. A classical aesthetic is possible with the use of wood and a modern aesthetic is achieved with a daring mix of glass tops and bright colors. 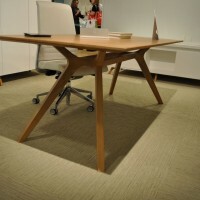 The leg structure of the desk is carved entirely from solid walnut wood. It is offered in a natural walnut wood finish, and a white or black painted finish. The desk top is available in natural walnut, white paint, and transparent or black glass. Wood tops feature tapered solid wood edges that accentuate the lightness of the surface. Wood is coated with a low emission, UV cured finish. Desks may be freestanding or specified in a runoff configuration with the use of side service units. Visually interesting work surface height differences help define the units’ role – desk heights are standard while other work surfaces can be lower to allow better visual reference to work in progress. The service units are offered in three different lengths and feature a worksurface glass insert. 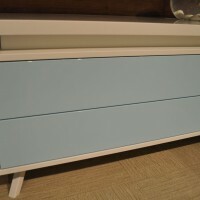 They’re available with contrasting finishes on doors and drawer fronts. The desking is enhanced with coordinating cupboards. 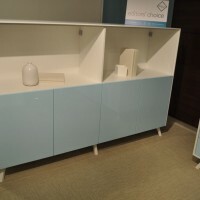 Cupboards are offered in two widths and two heights and have solid wood legs. 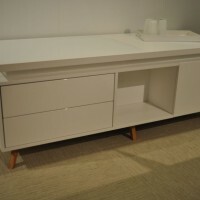 The units are available with a combonation of doors, drawers, and open storage. 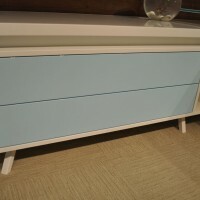 Door and drawer fronts may be specified in wood or a contrasting colorful paint finish.